Okay, some of these facts aren't exactly "fascinating"...more like humiliating...but that doesn't start with a "F". And it's all about themes, people. 1. I spotted an amazing deal on some dresses. Not that I'm exactly a dress-wearin' type of girl, but a good deal is a good deal. Plus, buying clothing for myself never seems to happen. Those clothes that were purchased three babies ago are no longer working so something had to be done. When the long awaited package containing the beautiful new clothing arrived, I scurried off in excitement and snatched up the box. I eagerly donned a new dress feeling oh-so human-like again. It was a great day! Or so I thought. In walked our daughter who pointed out my new dress. Next words to leave her lips were "You're having another baby, aren't you? I can SO tell!" Ummmm....that dress is so going in the trash! The moment was ruined! 2. Since our youngest was born, I've TRIED to start an exercise regiment. Ya know, it's the healthy thing to do. Okay, I'm so not a healthy person or instances like the one above wouldn't occur. I did, however, commit myself to at least enduring a few crunches in the morning. Two problems. One, I have MAJOR commitment issues. Two, laying on the ground and thinking one might be able to do this unnoticed is merely a dream. Anyone who dares to encompass the floor is really trying to set-up a giant obstacle course for two little boys. Yeah, those sit-ups are so not happening. 3. There has been two moments in my life when I was actually sort of, but not really, athletic. Once when I was involved in gymnastics, which somehow seemed to improve my running skills to the point where teachers/coaches were trying to fail me in certain classes if I didn't agree to join track. That tacit was definitely working. So you want me to run for your team. Sure, I'll be responsible and join for I know that adults are wise and know what is best...said NO TEENAGER EVER! 5. I'm getting close to my 100th post, y'all! Oh, my! I can't believe I've actually stuck with this whole blogging thing. So I'm trying to come up with something exciting to either write about or maybe even give away, but I have no idea what. That's probably not surprising, though. So if you have anything you'd like to know or any suggestions, please share! Okay, so maybe you could care less about this milestone, but I'm one of those stay-at-home-moms (SAHM) whose daily activities rotate around locating the child with the smelly bottom and convincing a casual dumpster-diver that snacks are NOT found in the trash can! *Linking up with Sunday Snapshot. 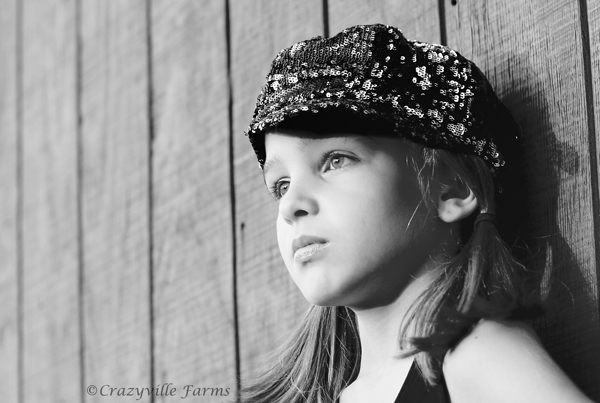 Check out Stefanie's blog for some great photog inspiration! Love the moodiness of this shot. It makes you wonder what she is thinking. love the lighting and black and white conversion. You are hilarious. I have been meaning to do situps since my daughter was born 11 months ago. I usually get a couple of crunches in before I decide that it's just too annoying! Maybe I'll just invest in some spanx. Your daughter response to your dress my me laugh and sympathize at the same time. Ah the life of a mom.